This is it. We’re almost in the home stretch for Avengers: Endgame and Marvel Studios is turning the screw when it comes to the superhero hype train. 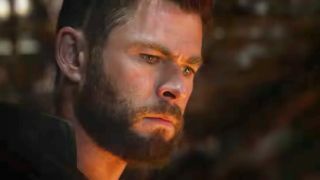 It’s just released the official Avengers: Endgame synopsis and while it, predictably, given the trailers, isn’t too heavy on spoilers, it offers a tantalising glimpse into what promises to be a massive final showdown with Thanos. You ready for this? Gulp. In case you were having doubts, it all ends now and we’ll probably have to pack a Hulk-sized supply of tissues. You don’t call something a “final stand” without a casualty or two along the way. Plus, there isn’t any reference to timey-wimey nonsense, the Quantum Realm, or any other big master plan from the Avengers. It sounds like it’s going to be the Avengers vs. Thanos part two in a physical, gruelling battle. This time it’s mega personal. Other than that, the Endgame synopsis has followed the lead of its recent marketing. Namely, it’s keeping things very close to its chest. Which can only be a good thing. Sure, sweeping statements like “grand conclusion” sets the scene nicely, but it’s only place-setting before the main course come April 26. Not long to go now – but who knew 40 words describing an outline of a plot could get us so excited? Worried about which of our heroes might bite the dust? Check out some of the best Avengers: Endgame theories for clues!